Yaxley FC have their sights set on several promotions, but they need help to get there. 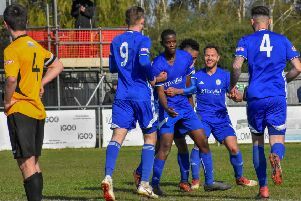 Ambitious club president Jeff Lenton has launched an appeal for investors, business partners or even new owners to propel the United Counties Premier Division side into the non-league big­-time. Lenton has master­minded some impressive off-field progress at In2uitive Park, but after 15 years at the helm he’s ready to retire. The 62­year-old believes his club offers an ideal opportunity for lovers of local football to make an impact on the non­league scene. “Yaxley FC has become a victim of its own success,” Lenton stated. “We have created a sporting giant which is growing so fast month­-on­-month than we are struggling to manage it. “Everything is in place for this club to go places. I don’t see why we can’t get to the division below the Conference with the right backing and support. Anything higher would be difficult given our location. “I don’t believe in throwing money at a project and hoping for the best. I want backers to invest in the business and show the devotion and commitment I have shown. “It’s a self-­sustaining business. We have four companies based at the ground who help the football club thrive. “The facility is, by common consent, outstanding. It’s well­respected and well­ used. “We have four other clubs who either play on the 3G or on our grass pitch, and we have clubs like Posh, Kings’ Lynn and Cambridge United who either want to, or do already, hire out the club for training. “I have put my heart and soul into the project, but I want to retire. I’m happy to stay on and help and advise, but I am looking for partners, or a consortium to help drive the club forward. In2uitive Park boasts a 3G pitch, a full-­sized grass pitch, a function room and a popular bar area. There are plans to build a fitness centre and a grandstand with seating for 400 fans. There is also the prospect of a residential international sports academy. Yaxley already run junior teams up to Under 18 level. “Obviously the desire to get up through the leagues requires more money,” Lenton added. “But that can be raised by developing the assets we already have.